With the latest Release the Entry Check App has not only adopted more of the Lightning Look and Feel, but we have also been able to provide more functionality in Lightning, so that you can migrate from Classic to Lightning without losing functionality, or if you start on Lightning to leverage the Entry Check functionality which our customers have enjoyed for several years. 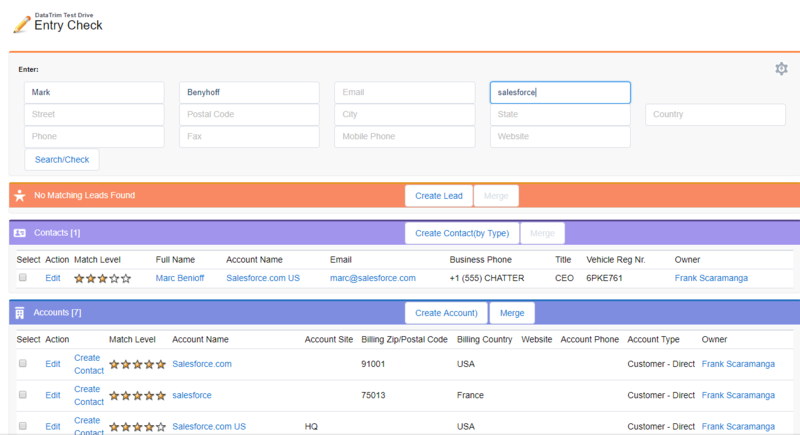 Merge and Convert Buttons are now available from List Views on Leads, Accounts and Contacts. Including New Merge and Convert Wizards. One of the favourite features, the Dupe Status can now be placed in the right-most column (instead of having it on the Detail Page only), giving your users the option to see the Dupe Status regardless of whether you have the Detail, Related List or Activities occupying the left-most column. The Dupe Status allows your users to merge/convert the duplicates on the fly, whenever they come across duplicates while doing their daily activities with the Leads, Accounts and Contacts. The Quick Entry Check, which will speed up the entry of new Leads/Accounts/Contacts while ensuring that the end users are not entering duplicates, can now be placed on the Home Page, or in the Utility Bar for quick access anywhere in the App. General availability: May 2015, a new version of DataTrim Entry Check.